There are three amazing venues for paintball in Kent and you'll be hard pushed to choose the best one for you. All set in the stunning Kent woodland these venues promise a great day of paintball. 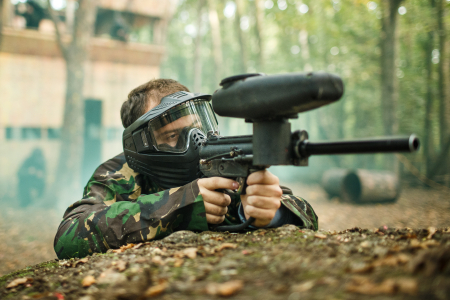 Canterbury, Rochester and Sidcup are easily accessible from any location in Kent and all have great paintball fields to test your bravery on the day. The latest in paintball technology is also available at these sites with goggles that wont steam up and markers that wont break on you at a key moment in the game! Whether your looking for a birthday celebration, stag / hen event, corporate day or just a fun day out with friends paintballing in Kent we have a friendly team of trained staff on hand to host your event. Click on the one of the locations listed below for full information. Upper Harbledown, Canterbury, Kent, CT2 9AX. Nurstead Road, Park Hill, Kent, DA3 7AN. Ruxley Wood, Sandy Lane, Kent, DA14 5AH.